I am helping promote the return of the Glasgow monthly Rum Club. 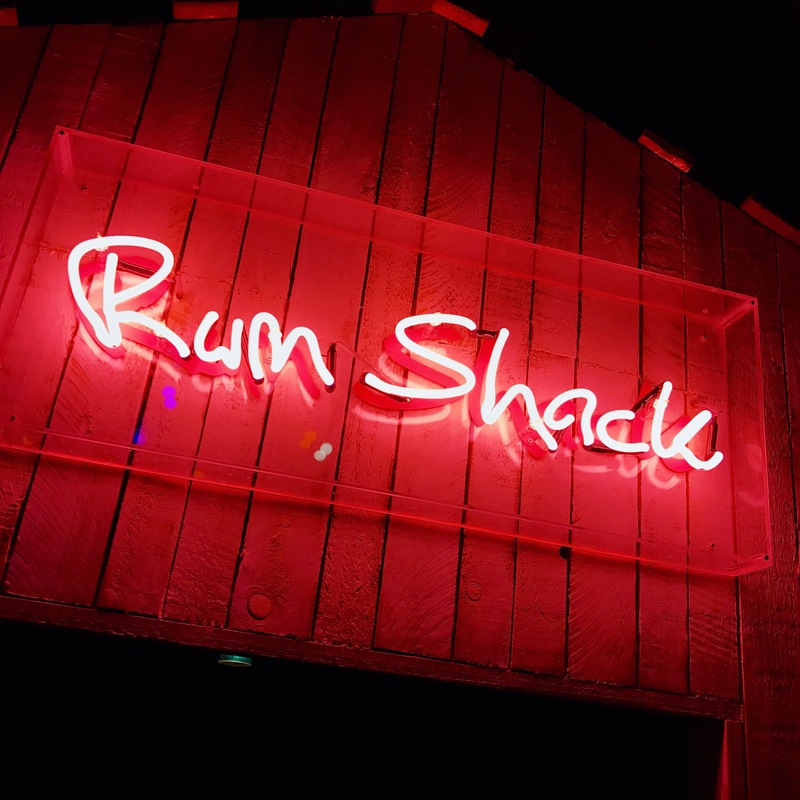 If you didn’t know Glasgow had one ,there was a regular Rum Club all of 2016. It was held at the now closed Sugar Dumplin, so now we have a new location. The date of these events are still TBC, but we are thinking on a Tuesday evening and either the last Tuesday of the month or the 1st Tuesday. We have a fantastic and passionate host, who will teach you about different rums and give you a good laugh at the same time. The cost is £10 on arrival, so you don’t need to worry about loosing any money…just pay at the door. You will taste and learn each month, a different selection of rums and the history. Food to nibble on while you taste and learn. The events last year had a good following, and everyone that attended loved the tasting, met new people and most importantly had a laugh and an enjoyable time. I was recently lucky to be invited to Glasgows new restaurants, I had seen a lot of promotion for Revolution de Cuba on Facebook and Twitter so I was looking forward to trying it and now with this invite I get to see it first. When I got invited I was asked for my address so they could send the personal invite out, I had forgotten about this till I came home from work and saw I had a small package. My first thought was “what have I ordered on Amazon” and then I opened it. To me this sounded like a nicely planned evening. I am the type of person that always prefers to be early, than leave last minute and be late. I was the first to arrive, so this gave me a perfect opportunity to take a look about and take some photos. I was welcomed and shown to a long table, where the night would start. I was then brought a welcome cocktail, and this was very nice I could have had a second. Slowly more people started to turn up and sit next to me, I finally got to meet Amy from Amy’s Food Blog @_Dont_Byrne_It_ just like our chats via Twitter Amy is a lovely girl and I look forward to meeting her again. At the table we all introduced ourself and added on Twitter/Instagram etc. and followed back. The staff then brought over some table nibbles, and all of it was very nice and went down a treat. Half way through the nibbles, our table was asked to go over to another one for the gift making part. On arrival at the table we had a small jar in front of us, and there were several containers with different things inside them….we were soon to learn what each container held. Each container held different spices that when combined made a really nice rub to put on meat. This was interesting and fun to mix the spices, and another nice little touch allowing us to take a little of tonight away with us. Once everyone mixed their own spice, we then headed over to another area to do the Rum Club. Most of you that know me, or follow me on Twitter know I go to a monthly rum club so I was interested how this part would be. Two members off staff were hosting this part, and let everyone have a small sample taste of each rum. This was a nice touch, and introduced different rums to the group i was with, for me I would have liked a little more detail about each rum but I think due to time constraints this was why it was just a little info. This one the main part for me that I was looking forward to, as I like to try new places and new food styles. We were all spoiled from start to finish, and even with the food. An empty table turned to a fully covered table. I can’t fault any of the food that was served to us, everything was full of flavour and very nice. I decided I HAD to try a cocktail from their list, to compare it and I spotted my favourite “Pornstar Martini”. This for me is my main favourite as I have had this drink many many times in 2016, so it was now time to try it here. The prosecco shot was fine, you cant really go wrong with this. Now for the martini, well….I was very disappointed. The flavours of this were very tangy and citrusy, unlike the other ones I have had that have been nice and smooth this wasn’t. Previous ones have tasted like the old drink “Um Bongo”. For me this didn’t work, but for someone else it might depends what they like. Overall the event was a great success, everyone I spoke to loved it and had fun. We all made new friends, and enjoyed it from start to finish. Also would like to thank Valentina, our waitress as she was very pleasant and helpful. The group of girls I got chatting to were all really lovely, I had a great time and due to the laughs and chats it made it extra special. I look forward to meeting them again in the future. Will I go back? yes, if its anything like tonight then I look forward to going back and even being there when there is live music. For those of you that don’t know the Glasgow Caribbean restaurant Sugar Dumplin, do a monthly rum club. Each month a new brand, style of rum or both is featured and discussed and sampled. This month the topic was Spiced Rum. A delicious, high-quality spiced rum from Richard Seale’s Foursquare distillery on Barbados, home of Doorly’s and St. Nicholas Abbey. This rum has hints of cinnamon, vanilla and nutmeg. For me when I smelled this i got a very light hint of vanilla, but others at tonights club got cinnamon or nutmeg or all. It comes in a tall bottle with a dripped wax sealing, this covers the metallic screw top. For me this was nice, it was nice to smell and also the flavour was pleasant. 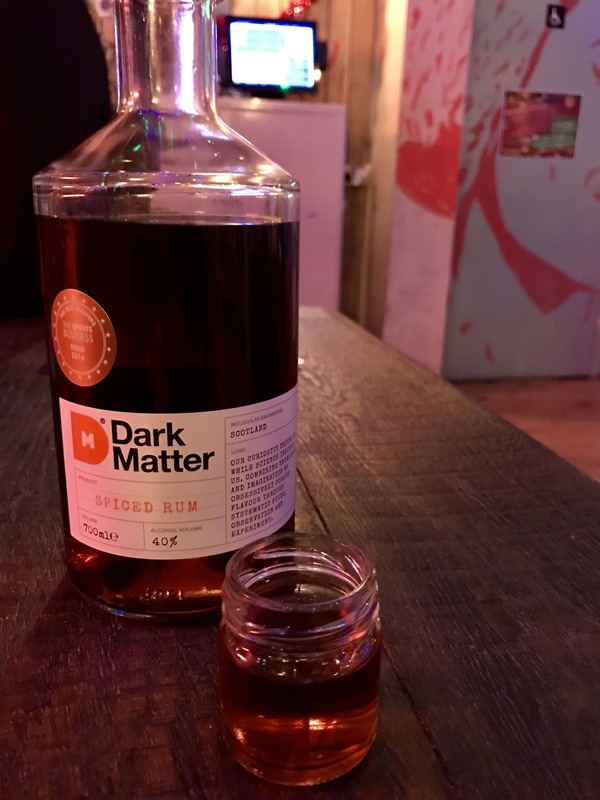 The first release from Scotland’s Dark Matter Distillers is Dark Matter Spiced Rum – very exciting stuff! Created in Banchory by two brothers, Jim and John Ewen, Dark Matter Spiced Rum is a molasses-based rum that features full-bodied notes of long pepper, fresh ginger, green peppercorns and allspice. The spice was so overpowering! The smell off the small shot we got was very powerful, the cinnamon could be smelt right away. The first and every taste after was very powerful again, it wasn’t a burning feeling it was a thick and warm after feeling on the throat. This was nice, in small amounts on its own it could be ok but it really needs to be mixed with something to lessen the strong taste. 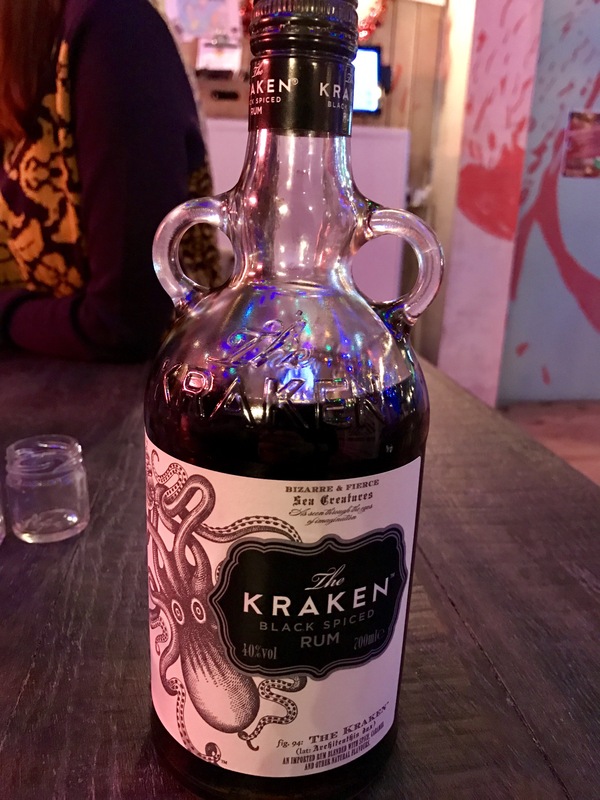 A dark spiced Caribbean rum introduced to the UK in Spring 2010, Kraken’s old-style bottle and superlative packaging seem to earmark it out for greatness, and perhaps it will help some of those many thousands of punters nursing an old-recipe-Sailor-Jerry-sized hole in their hearts. 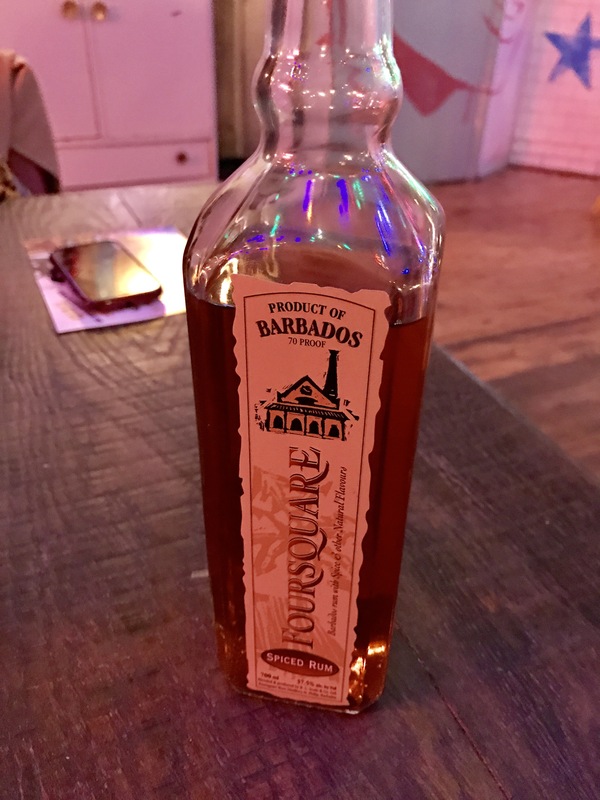 This rum has a lighter and sweeter taste to it, the combination of flavours gives this a more sweet and very appealing taste for me as I have a very sweet tooth. For me this was the best out the three. Just like the others it had a nice smell to it, and this was not as strong as Dark Matter and was nice and sweet to taste. We then got to try a cocktail made from one of the above Spiced Rums, this was really nice and good to taste as the rum added the nice spiced flavour to a sweet cocktail. Again I don’t like to go into too much detail about these Rum Clubs, as it more of a you need to be there than a read about it. If your interested in coming and why wouldn’t you be? its free, fun, you get to meet new people, learn about rum, have a laugh and get some really good food. So if your a yes then I would say follow Sugar Dumplin on Facebook, or me on Twitter or both as I always try and help promote the event on Twitter.